You can make 100% recycled paper at home. Here’s how! Make a mold for the paper by stapling the nylon fly screening tightly to the wooden frame or securing it in a needlework hoop. Build a drying pad by folding and stacking newspapers about two inches high. Cover the stack with a kitchen cloth. Tear the old newspaper into small pieces and soak them in hot water for about 30 minutes. Put the wet newspaper pieces in the blender and blend it until it has a mushy consistency. You can add flowers, leaves or other decorations to the mixture. Using a mixture of about 80% water to 20% pulp, fill the large plastic basin with water. Add the pulp while stirring. The particles should be floating in the water. Dip the paper mold in the water from the back and bring it down so that it is under the water. With a scooping motion gently lift the mold out of the water. Allow the water to drain and carefully turn the mold over unto the drying pad (screen on top). Use the sponge to absorb the excess water. The pulp should become dry enough to separate from the mold. Lift off the mold and put another stack of newspapers on top and press down firmly. Allow the sheet of new paper to dry thoroughly. Iron your paper with low heat to create a smooth finish. Use your 100% recycled paper for note cards, as frames for pictures in a scrapbook or for any other craft projects you can think of! 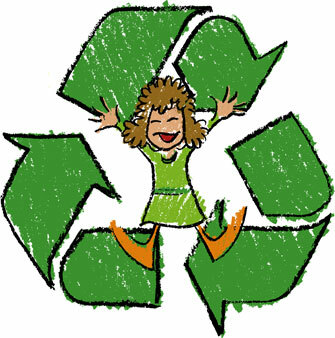 Would you like to learn more about recycling? Check out our great list of books for everyone! Before the U.S. become a country, we were recycling paper. In 1690, William Rittenhouse started the first American paper mill near Philadelphia, PA. Both William Penn and Benjamin Franklin supported early papermaking projects. Paul Revere is known to have engraved plates for “money paper” sold in 1776 by Stephen Crain. The Crain Company, of Dalton, Massachusetts, continues to manufacture the “money paper” used in the U.S. today.